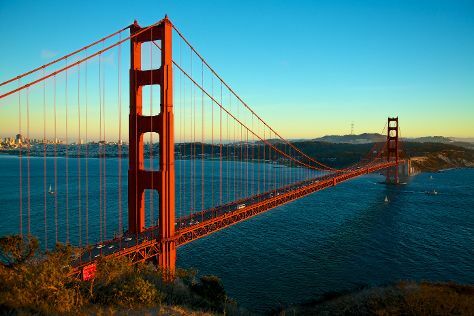 Start off your visit on the 23rd (Sat): snap pictures at Golden Gate Bridge, then head off the coast to Alcatraz Island, and then take a leisurely stroll along Fisherman's Wharf. For reviews, other places to visit, maps, and tourist information, refer to the San Francisco trip planner. If you are flying in from United States, the closest major airports are San Francisco International Airport, Metropolitan Oakland International Airport and Norman Y. Mineta San Jose International Airport. In June, daytime highs in San Francisco are 71°F, while nighttime lows are 55°F. Finish your sightseeing early on the 24th (Sun) so you can travel to London. London is known for museums, nightlife, historic sites, shopping, and parks. Your plan includes some of its best attractions: enjoy breathtaking views from The London Eye, learn more about the world around you at Natural History Museum, take in the spiritual surroundings of Westminster Abbey, and don't miss a visit to Tower of London. For other places to visit, reviews, where to stay, and tourist information, go to the London holiday planner. Getting from San Francisco to London by flight takes about 14 hours. Other options: do a combination of flight and train; or do a combination of bus and flight. The time zone difference moving from Pacific Standard Time to Greenwich Mean Time is 8 hours. In June, plan for daily highs up to 68°F, and evening lows to 52°F. Finish your sightseeing early on the 28th (Thu) so you can travel to Mumbai. Kick off your visit on the 29th (Fri): indulge your taste buds at Food & Drink. For ratings, photos, other places to visit, and other tourist information, you can read our Mumbai trip itinerary builder tool . You can fly from London to Mumbai in 11.5 hours. Due to the time zone difference, you'll lose 5 hours traveling from London to Mumbai. Traveling from London in June, expect Mumbai to be much hotter, temps between 90°F and 79°F. On the 29th (Fri), wrap the sightseeing up by early afternoon so you can travel back home.